Only 27% of about 3700 children’s books published in 2018 featured a protagonist of color. That may be higher than the 11% seen a decade ago in 2009, but it still doesn’t meet the needs of the increasingly diverse America of today. We need diverse books, as both mirrors for children of color to see themselves represented in and as windows for children to gain insight into lives, cultures, and oppressions unlike their own. The following upcoming chapter books are promising mirrors and windows that will not only help your child avoid the 2019 summer slide, but also encourage them to find compassion, to find themselves, and build a better world for their future. Historical fiction meets the supernatural in this “absorbing, multilayered novel” about a boy whose trip to the New York Public Library sends him on a ghost-led tour of some of the neighborhood’s unsettling racist history. A very timely novel about a young Syrian refugee trying to fit in at her new school as she navigates her new American home and the fear and homesickness that comes with leaving everything you’ve ever known. Publisher’s Weekly gives this important story a starred review. Mya Parsons is a new character for your feminist child to look up to. Mya is a bleeding heart activist who takes up just about every social cause she discovers and when she decides she wants a cell phone, the human rights abuses of the cobalt industry naturally arise. The Bulletin of the Center for Children’s Books writes that Mya’s Strategy to Save the World lends itself well to both discussion in a classroom setting and independent reading. One of the most amazing things about children’s books is their ability to be a window into a world that a child could not otherwise experience. Orange for Sunsets is set to be a great addition to that list of books. Set in 1972 Uganda, right after the President’s order to deport anyone of Indian descent, this story follows two children as they struggle to maintain their friendship through a political unrest that paints their differing heritage as incompatible. Silver Meadows Summer is a classic children’s story about struggling to fit in but from the perspective of a Carolina, a Puerto Rican girl whose family has just moved to New York. Carolina struggles to be like other students but everything is so new, and she has fears about losing her culture. Silver Meadows Summer has received positive reviews from many publications including School Library Journal. Zoboi’s debut middle grade novel is scheduled to be published in August, but is already getting a ton of buzz for its representation of Ebony-Grace, a young, ambitious black girl who dreams of space, but struggles to connect her passion to Harlem, where she is staying with her father for a few weeks. Zoboi’s young adult novels have been well-received, and I suspect My Life as an Ice Cream Sandwich will be equally as satisfying! Kirkus gave this upcoming novel a coveted starred review, saying it “describes an unjust system too many kids know intimately.” Thelonius and Nehemiah become suspects when a gun is found in their neighborhood park. This novel is sure to shed light on how young black boys can’t engage in silly childhood mischief without being viewed as criminals by society at large. Lockington has chosen the perfect title for her novel. Written in a combination of prose, poetry, and even blog posts, this book tells the story of Makeda, a young black girl adopted by a white family. Like many of the middle school girls who are sure to pick up Lockington’s book off the shelves for the title and cover alone, For Black Girls Like Me is about a girl trying to figure out who she is and what part her race plays in her overall identity. Fantasy is a genre notorious for adhering to a white default, but occasionally, a fantasy series comes along that breaks that mold. Dactyl Hill Squad is one of them. Dactyl Hill Squad has gotten starred reviews on both of its installments so far, by cleverly combining dinosaurs with interesting bits of American history. Pie in the Sky, a book about the Chinese immigrant experience, is a great choice for adding diversity to your reluctant reader’s summer reading list. This novel is written Diary of a Wimpy Kid-style, with lots of illustrations intermixed with the prose. 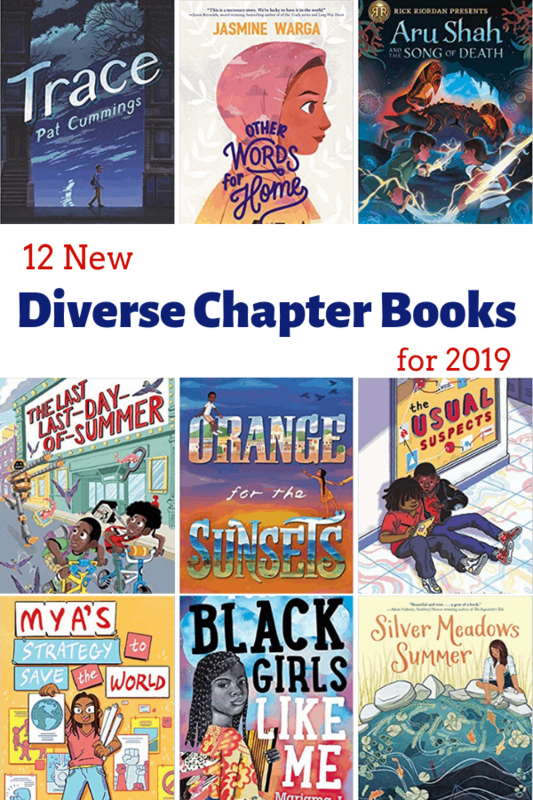 If you enjoyed this list of Diverse Books, you’ll love our newsletter. Sign up today!